If only they taped this stuff for daytime, like Judge Joe Brown. Louis Vuitton is a tornado when it comes to trademark protection, destroying anything and anyone who poses threats you never realized existed. The label may have won court battles with eBay, Britney Spears, and P. Diddy, but now it's taking on the Internet's all-powerful ruler: Google. Vuitton has been battling the search giant for years. They don't like how when you Google a designer name, results come up from companies offering similar products who have paid for such placement. Especially since some of those companies sell counterfeit products. At last, the case is going to the European Court of Justice. 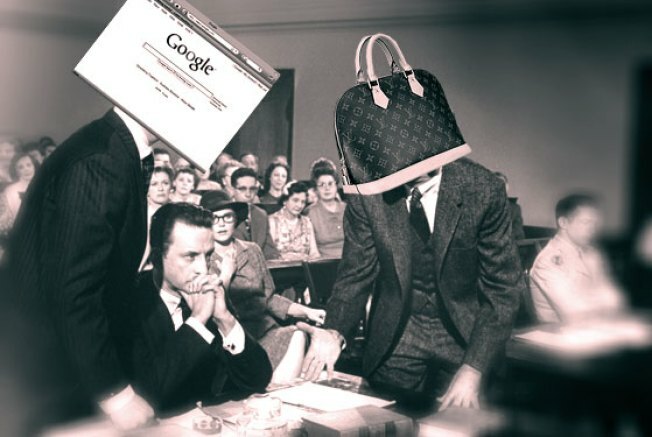 Louis Vuitton's lawyer argues, "Google's advertisement activities have given companies which sell fake products unprecedented visibility beyond their wildest dreams." But Google's lawyer counters, "Google makes money not by reason of the nature of the keyword, but by someone clicking on the keyword.... The decision to click or not to click belongs to whom? Clearly to the Internet user." So if Google wins and a judge rules the prevalence of Internet counterfeiters is our fault, does that mean Louis Vuitton will sue us? Or at least, those who buy faux Vuitton? That wouldn't bother us. Fake Louis bags are not merely hideous in appearance but also in principal, since counterfeit bag makers employ child labor and support drug trafficking. Oh, and remember who owns one? Sarah Palin. Lose Your Job, Not Your Suit?